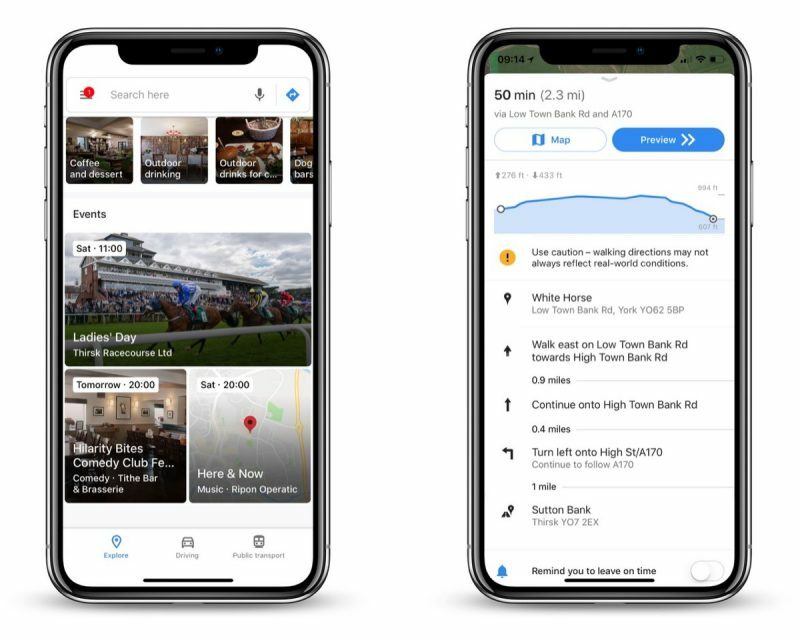 Google Maps received an update today that introduces a couple of potentially useful new features, including a new section that lists notable events happening nearby. The new Events section lives at the bottom of the Explore tab, where users can find a variety of things listed depending on what's going on in their location. Google says Events that appear in the new section can include everything from late night comedy shows to movie screenings in the local park. Also new in version 4.57, cycling and walking directions now feature a handy elevation chart, offering users an idea of how much physical effort they can expect to exert for the route in question. Elevation information has been available for some time on the Google Maps website, so having the data in-app should come as a welcome addition. Updated how many times Google's Maps App continually reports back to their servers about your location data that is "anonymous" but continually does so about 13x per minute against your EXPLICIT settings denying the app to do so under Settings> Privacy> Location. On the flip side... if I deliberately open an app to track my location and give me directions from where I am at this moment to where I want to be, then I do obviously want to be tracked accurately by the millisecond (considering driving speed). Alternatively, I do suppose you could go with less frequent tracking. Perhaps that’s why Apple maps seems to think I should drive my car into lakes, oceans, rivers, or any other body of water that isn’t actually a road. It does occasionally choose a different destination, like a guard rail, a mountain, or a median. I use GPS to locate job sites all day long. Apple maps frequently activated accidentally. When I realize that I’m driving in circles or being told to crash the car, I switch to Google Maps. If I don’t want my activity tracked, I probably wouldn’t be deliberately using a location tracking navigation device or application. Google maps is really starting to irritate me with its cluttered interface. When I open the app, 40% of the screen is the map and the rest is covered in menus and information I have no need for or requests for information I don’t want to input. Google maps makes Apple maps look like something from the stone age. With all that money Apple has, you would think they will invest in a half way decent app. Real shame what a joke Apple maps is. Can’t wait for iOS 12 to get this in CarPlay ! For your livelihood indeed you need accurate and safe tracking and map routing. My post was specific to those that don't want to be tracked when the app is NOT in use, specifically closed. I should've been more specific sorry. I wonder which sources that Google Maps will get the information for "nearby events" and how often the info is updated...? I agree... we would really like to know how this content is being generated. Is it contribution content or are they looking at people's Google calendars and creating content from that. I guess it depends where you live. I continue to hear and believe the horror stories people on this forum tell about Apple Maps. But because Apple invested in surveying my region, my experience is largely positive. I prefer my Android phones for a lot of reasons, but Apple did such a great job surveying my region right down to backwoods routes that are barely paved. I love the taps I get on my Apple Watch alerting me to when I need to start changing lanes. So it may end up being Apple Maps and not iMessage that keeps me on an iPhone. I am not fond of driving and I’m absolutely wretched at navigating, so Apple Maps has made a world of difference to a very stressful commute in a region that is an absolute commuters nightmare with traffic problems galore even on the rural routes. When they started transitioning agricultural land to McMansion neighborhoods they neglected to care if existing infrastructure could support the increased traffic. It can’t. So we end up with almost daily accidents that result in cars being shunted to alternate routes causing traffic jams for miles on roads that look like something out of “Deliverance” and by all rights should be nearly empty.